I hope you all had a lovely festive break filled with lots of love and laughter. Over at Just Add Ink the Design Team members are doing a quick review of their favourite projects from 2012. I picked this one because not only do I think it looks fab but it was fairly quick and easy to make! But the most important reason I picked it was because it was made with love for my Mum for Mother's day. Hope on over to Just Add Ink to see the other fantastic inspiration ideas from the other Design Team members. 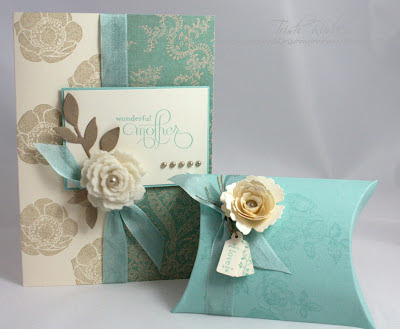 I'll be back next week with a fun "BIG SHOT BLOG HOP"
I love this project of yours! Perfect pick. just gorgeous. Love the colour scheme and choice of stamps.